"Warning! Do not sear the top of your neck hole in the molten lactate extract of hoofed mammals." I'm surprised no scientific acclaim has been showered upon Lorne Michaels and the producers at SNL studios. After all, they have obviously invented some sort of time warping device. Again and again, they have stretched a five-minute SNL sketch into a full-length movie. Surely this feat of technological brilliance could be put to better use? 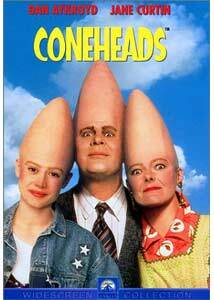 In 1993, the target was the popular skit featuring the Conehead family. They are called the Coneheads because their heads are large and conical. When you have finished laughing, please continue reading. Welcome back. The old SNL skits weren't especially developed. The Coneheads, alien beings stuck in middle-class America, were funny simply by existing as strangers in a strange land. The dialogue wasn't particularly witty, and the characters certainly weren't very complex. Instead, the humor sprouted from the Coneheads' misunderstanding of everyday objects. Not the strongest set-up for a full-length movie. The film begins with the Coneheads crashing on Earth. The couple attempts to settle down and live as humans until a spaceship from their planet can rescue them. Beldar Conehead (Dan Aykroyd) has to get a job to support his wife Prymaat (Jane Curtin), who is "with cone" (pregnant). This requires them to get a fake social security number, which ends up leading the I.N.S. right to the family. That's pretty much the movie. The Coneheads and their (by now) teenage daughter (Michelle Burke) must keep one step ahead of the Federal agents (and all the while continue to have funny, alien misunderstandings). The performances from the leads are good. Aykroyd and Curtin are excellent as the robotic-walking, Speak and Spell-talking aliens. Unfortunately, this shtick becomes tired rather quickly (it's pretty clear why the average SNL skit lasts only a few minutes). The jokes amount mostly to sight gags or wacky alien phrasing (the Coneheads speak in detailed, literal terms: car becomes "transport module"), and run the gamut from "mildly chuckle-worthy" to "when does The Simpsons start?" Once in a while, an SNL film will turn out well, but it requires the writers to pad out the sketches with well-drawn characters and a compelling story. Usually, however, they turn out like Coneheads, which pretty much plays like a VHS mix-tape of the same sketches, over and over again, for an hour and a half. Can't wait for "Morning Latte: The Movie." Image Transfer Review: Paramount has provided a nice, crisp transfer for Coneheads (lucky for them, otherwise I'd force them to narfle the Garthok!). Colors are nice and saturated (this is a very colorful film). I noticed no blooming or bleeding, even of the very bright reds. Black level was excellent as well. There is no edge-enhancement and just a bit of artifacting (due to several darker scenes with visible film grain). Audio Transfer Review: This audio track is better than I was expecting. True, most of it is the usual front-heavy comedy mix, but during the space battle scenes and the two "action" scenes, the surrounds kick in a bit with ambient noise and crowd reaction. Dialogue is relatively clear, but it seems to be mixed a little low (I had to fiddle with the volume levels throughout the movie). There aren't a lot of instances split surround use, but there are some scenes with directional and panning effects. Overall, the mix is a nice match with the film, but I had to knock it down a notch because of the dialogue problem. Extras Review: Paramount has really seared the top of my neck hole with their high prices and minimal extras. Coneheads features only the trailer, in anamorphic widescreen. Ah, another SNL sketch stretched from five minutes into 90. The movie wears thin after about ten minutes, but Paramount has provided a nice transfer at least. However, due to the less than gut-busting film, the lack of supplements, and the steep $29.99 price, this is recommended only to the most die-hard Coneheads flandaps. I'm sure they'd appreciate having the movie on a format that will last for zerls and zerls.